Creating your own diy cupcake centerpiece will not only provide you with a unique wedding decoration it will also give your wedding guests an edible treat at the end of the meal. Who says guest shouldn’t be able to eat the wedding centerpiece! 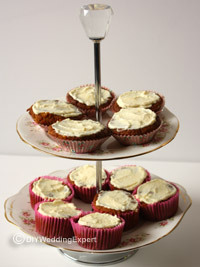 Let your guests enjoy their cupcakes with the coffee at the end of the meal by demolishing the wedding centerpiece. I’ve used a vintage cupcake stand to display my DIY wedding cupcakes, this stand is a great height for a wedding centerpiece, as it won’t block the view across the table. You could collect different cake stands from thrift shops, supermarkets or action sales (where I got mine from) so that every table has a unique DIY wedding cupcake centerpiece. A two tier stand will gives you enough room to hold 14-16 cupcakes so there are a few spare for those sweet toothed wedding guests! 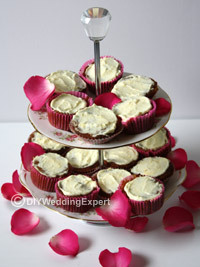 I think this DIY cupcake centerpiece is a great way to treat your guests and decorate your wedding reception tables. 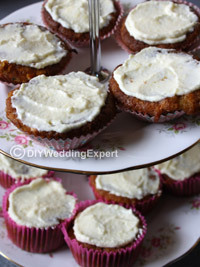 Learn how to make DIY wedding cupcakes.